Clear the Forsworn from Kolskeggr Mine. Talk to either Pavo Attius or Skaggi Scar-Face. Upon arriving at Left Hand Mine outside of Markarth, you may overhear a discussion between Skaggi Scar-Face, who is in charge of the mine, and Pavo Attius. 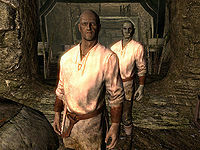 Pavo and his fellow miner Gat gro-Shargakh are the only survivors of a Forsworn invasion of Kolskeggr Mine. Skaggi is visibly upset by this news; he gives the two survivors permission to stay at Left Hand Mine, and vows to send word to the Jarl. If you speak with Skaggi, he expresses his concern over the increasing Forsworn threat and the timeliness of a response from the Jarl. If you agree to clear out the mine, he will be grateful, but skeptical about your ability to survive. Speaking with Pavo will also initiate the quest and he will also offer the same sentiments about the Jarl's response and your success in the mine. Make your way to the mine, which will be marked on your map if you haven't previously discovered it. Several Forsworn will be standing guard at the mine's entrance, with more inside. Once you've killed them all, head back to Left Hand Mine. Speak to Pavo with the news of your success. He will be suitably impressed at your accomplishment and reward you with a leveled amount of gold. He and Gat then return to work at Kolskeggr Mine. Once Pavo returns to Kolskeggr Mine, he will offer to buy gold ore from you. His services are of limited use, however (see bugs below). Since finishing this quest helps Gat too, he makes you Blood-Kin with the Orcs if you aren't already. Even after fulfilling the quest and letting the miners reclaim control of Kolskeggr Mine, the Forsworn will respawn the next time you visit the cell. They will kill the miners off if you aren't quick enough. It's possible to save them; just make sure that you quickly dispatch the two Forsworn near the bridge. The miners and a guard will easily dispatch the one at the top. You may be able to repeat this quest when the Forsworn there respawn, as long as you stay away from Kolskeggr Mine and avoid triggering the event in which the miners try to reclaim control. Stronghold Orcs may fail to recognize you as Blood-Kin after completing this quest. The following empty quest stages were omitted from the table: 15, 100. On the PC, it is possible to use the console to advance through the quest by entering setstage FreeformKolskeggrA stage, where stage is the number of the stage you wish to complete. It is not possible to un-complete (i.e. go back) quest stages, but it is possible to clear all stages of the quest using resetquest FreeformKolskeggrA. This page was last modified on 19 May 2017, at 21:07.